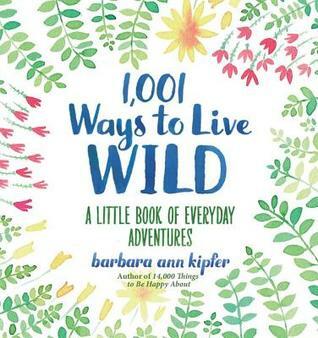 Bestselling author Dr. Barbara Ann Kipfer pours her creativity into an irresistible book of bite-size lists of motivation for leading an adventurous, happy, and fulfilling life. Filled with light-hearted quick hits of inspiration to stir anyone looking for a jolt of "get out there and live" in their lives. Short entries—musings, things to do, and inspirational quotes—are paired with whimsical, colorful spot art. Presented as one continuous list, and broken up by occasional top ten lists and quotes, the text touches on many and varied themes such as: following your passions, staying curious, appreciating nature, traveling, trying new things, and living life with courage. Sprinkled throughout are service-oriented top ten lists, such as: 10 Places to Travel That Will Change your Life, 10 Spiciest Foods on the Planet, 10 Plants You Can Eat in the Forest, 10 Animals to See in Person before You Die, and more. This book is just absolutely gorgeous and fun to look at, first of all. Every page has the same florabunda style watercolor art work and hand-lettering, which makes it just a pleasure to look at. It's basically just a list of life adventures ranging from the mundane ("Go to a local sporting event") to the more extreme ("Travel to another country by yourself"). You've got everything from the free, five minute options ("Make eye contact with everyone you meet") to the more expensive, time consuming adventures ("Trek the Himalayan foothills in Myanmar"). It's also go lists and quotes interspersed throughout. Take it outside. It's spring in my neck of the woods and the weather is gorgeous and I've enjoyed looking through this and highlighting my favorite ideas while laying in the grass on the bank of the river that runs through my back yard, listening to the birds and watching the rabbits. It's paradise. And this book makes it even more blissful. Thanks to TLC for having me on the tour for this book. Click here to see the other stops on the tour! Ooh now I really want to grab a copy of this book and lay outside in the sunshine reading ... what a pleasure that would be! Taking it outside would probably give you even more ideas and motivation to read wild! Great idea!